Dr. Henshaw grew up outside Boston far away from his now beloved Lodi, CA and attended Pacific University near Portland Oregon. There his love for vision therapy began. After his Doctor of Optometry degree in 1967 he served five years in the Army during the Vietnam War as an optometrist at Walter Reed Hospital in Washington, D.C. There Dr. Henshaw learned vision therapy under Dr. Bob Kraskin, the optometrist who did vision therapy for a visually related learning problem that then President Johnson's daughter Lucy had. Walter Reed was near Dr Kraskin's vision therapy practice. In 1973 he moved to Lodi, CA and assumed this practice from Dr. Calvin Looser a pioneer in vision therapy who established the practice in the early 1900's. Dr. Henshaw has a specialty in vision therapy and is a member of the College of Optometrists in Vision Development (optometrists who specalize in vision therapy). 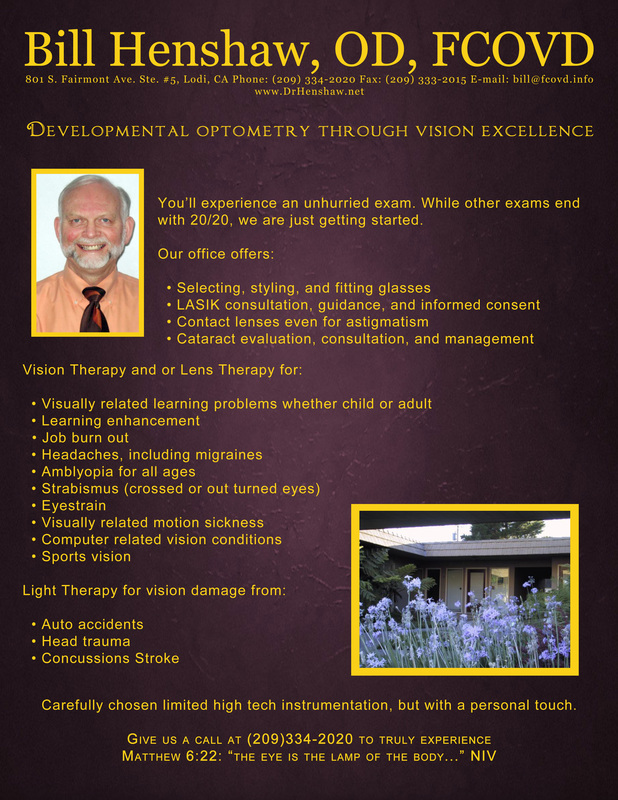 He has special training in vision and computers, visually related learning problems (including dyslexia and ADD), sports vision therapy, orthokeratology, and light therapy. He is a member of the Optometric Extension Program, College of Syntonic Optometry, a past president of the San Joaquin Optometric Society, and a twenty five year member of the American Optometric Association. He was active in Junior Achievement, and was chairman of the Governmental Affairs Committee for the Lodi Chamber of Commerce. As a Rotarian in the Lodi-Tokay Rotary Club he served as secretary and the Dial-A-Ride committee chairman and is a club designated Paul Harris Fellow. Dr. Henshaw hosted The Vision Excellence Hour - with An Eye toward Prevention on KCBC radio 770 AM for three years. The broadcast discussed vision therapy and related topics with a call-in audience. Judy, Dr Henshaw's wife is retired from a long career as a real estate broker. Her intrests include care of their Yorkshire Terrior, Shelly. Shelly was taken to Heave0n in April of 2016, but we found Bella, another Yorkie, in May of 2017.Between them are 7 grown children, 16 grandchildren and one great grandchild. He has interest in aerobics, cooking, hiking ( considerably slowed down), photography, computers, and reading. He attends a local Christian Church and has authored What Would Jesus See - a Developmental Optometrist's journey through vision care with an eye on the Bible- (available on Amazon). Developmental Optometry wins the Jan 2016 NFL Divisional Playoff game between Arizona Cardinals and Green Bay Packers ! Larry Fitzgerald literally took over and won the game for the Arizona Cardinals over the Green Bay Packers in two plays in over time. The win began years ago when Larry was struggling in school and his grandfather Dr. Robert Johnson provided optometric vision therapy to treat Larry’s visually related learning problem. As the visually related learning problem improved, Larry’s athletic abilities also grew. His grandfather continued optometric vision therapy further enhancing his athletic skills. They grew to the point of making him one of the best wide receivers in professional football. Dr Johnson just like Dr. Henshaw is a developmental optometrist who,among other treatments, helps people who wish to enhance their athletic skills or help with visually related learning problems. Dr Henshaw helped a golfer reduce his handicap by 6 points, worked with two professional racing car drivers, and an Olympic swimmer. His mentor is Dr. Bob Pepper who was an optometrist for the Portland trailblazers. Dr Henshaw applied Dr Pepper’s principles with a local high school basket ball team. If you wish to enhance the athletic or learning skills of anyone in your family give us a call at 334-2020.